Looking for bocce ball turf? Here at Custom Turf Outlet, you can buy and receive a professional grade synthetic turf bocce ball court. We sell it, with lines that are inlaid and will never fade, or without. Our premium bocce turf has 5mm foam backing for a soft impact and great playability. Bocce ball is a great game for just about everyone. It can be played between two players or two teams, the rules are simple and easy to understand. The game starts with each player receiving 4 balls, and a smaller ball called the jack. After the jack is thrown into the proper zone, players take turns trying to get their balls as close to the jack as possible. The player or team who lands closest to the jack gets a point, and the first to get 12 points wins. Artificial turf has many advantages for bocce ball and other sports. It saves time and money over watering and maintaining grass. It doesn’t require any treatment with pesticides and fertilizers. It’s also much more durable than grass, which means you can play on it longer. Artificial turf has an added element of safety, because it has an even playing surface with no bumps, holes, or mud. Bocce ball can be enjoyed by everyone from kids to seniors, at any skill level. 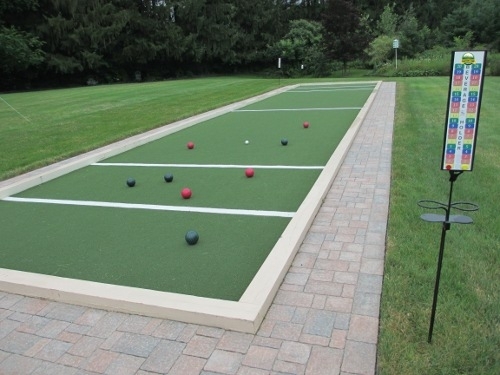 To start playing bocce ball, get your bocce ball turf with free shipping from Custom Turf Outlet.